I came across a Facebook post one day that caught my eye right away. It was of a picture of a pillow that said ” Just Breathe.” I loved everything about this pillow. I loved the colour and I loved the saying. I am constantly telling my clients, my daughters and myself to breathe! So I did some research and found out about Keep Your Cup Full. It is a positive mental health project raising money and awareness for mental health in Edmonton and starting the conversation. 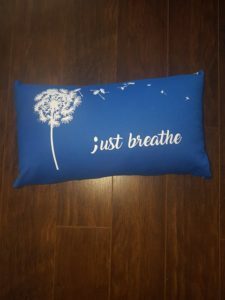 $5.00 from each cushion purchased is donated to a mental health organization. To date, $500 has been raised in support of the CASA Foundation (Child, Adolescent and Family Mental Health Organization). Mental health still has a stigma about it and there needs to be more conversations about mental health and how many people are experiencing and going through it. I truly love everything that Julie is doing! Please support her and buy one of her cushions! PY1 North. The name of the ward I was in for a week during the finals of my 8th grade year. To be honest, getting there seemed so easy the first time. The second attempt to get in there to heal was tougher. I had an incredible childhood with loving parents who supported me, gave me opportunities to flourish and try new things, and a school life that did not consist of bullying or a lack of friends. But the energy I once had and my zest for life slowly deteriorated… and it took me longer than it should have to realize it. I was diagnosed with depression along with social anxiety disorder and mild seasonal affective disorder. As a teenager I couldn’t properly comprehend that my diagnosis wasn’t linked to my home life or school life. I had thought that people could only be sad or have something wrong with them if things were going wrong around them. I’m still working on understanding that, to be honest. I tried different forms of antidepressants, joined art therapy and group counselling, and once I was out of the hospital for good I met with a few psychologists. None of them “seemed to get me” because I couldn’t even express how I felt. Talking only seemed to make it worse, which luckily for me is no longer the case. With my friends and family I was quite open about my struggle, I even had some friends visit me while I was in the hospital. As this was over ten years ago I only remember certain moments or things that people said or did. The doctor who assured me that the test results were wrong in saying I was schizophrenic because I had simply checked off the box that said I believed in ghosts. The constant voices of the Greenday song “Wake Me Up When September Ends” from the television back when Much Music was still…Much Music. And the girl who had started dating one of the boys on the ward who just knew their relationship would make it even after they both got out. Romance never dies, even in a mental institute. Over the course of the next few years I would make new friends and continue to be open about my feelings and heartaches, but would truly only mention my hospital stay to a boyfriend or two, or a really close friend. As a travelling performer I met thousands of new people a week, was riding the high of new experiences and seemed to have everything under control. Those dark days were memories of the past and I felt as if they would ever only be just that. Memories that hung in the air like a song after the bows were taken and the curtain closed. 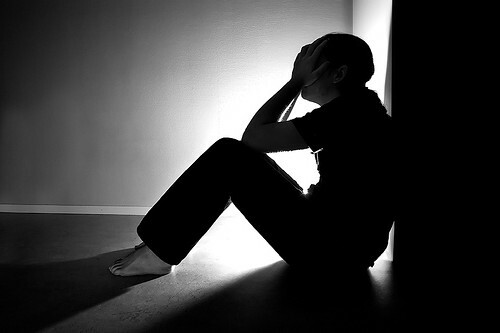 Anyone who has ever lived with depression knows that the show is never over. It will continue whether you’re okay or not. On an early morning in September a few years ago I had received a phone call informing me that my brother in law had died by suicide. About an hour later I had been told that a coworker chose to end their life the same way the night before. They did not know each other. They came from completely different backgrounds, different walks of life, but both decided that their struggle must come to an end. Not only did they end their life the same night, but their memorials were also on the same day. I wouldn’t say it was the hardest day of my life to endure, but it came with the most emotions. But it was not my own feelings that made it difficult. It the emotions of those I was surrounded by, it was seeing everyone else’s heartache. People who knew these men more than I did, thinking and wondering what they could have done, what they had missed, and if they could have changed things. If they could have been the one voice to make a difference. We have all asked that question to ourselves before in one scenario or another. Maybe if I had said this, then we could have avoided this whole situation. If I had taken a left turn instead of a right. If i had said no instead of yes. Endless possibilities and endless questions that only make your grief and pain worse. I realized though that through all of this, I wasn’t the one who needed to heal. I didn’t need the help, it was those who I loved that needed it the most. That week had showed me every possible emotion on the faces of those around me and that I could think about what ifs for those who were gone, or I could focus on those still here. I had the power to support them and knew that I needed to do more. So I enrolled in the ASSIST Suicide Prevention Course and the Mental Health First Aid. 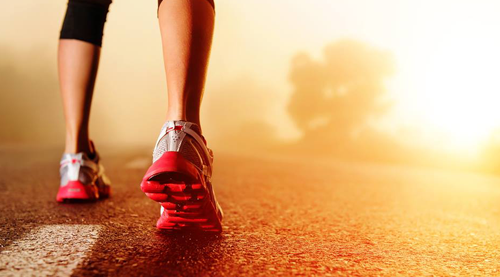 In my mind, the course was intended to allow me to provide support for those around me, but the more I learned the more I realized that they were therapeutic for myself as well. I was learning techniques and questions to apply to myself. I became more open with those around me regarding my own mental health and knew that I needed to focus on those where were still here. I can still be that one person who says the right thing at the right time. Over the next few years I had more downs than normal. I had breakdowns, moments of fear and panic, and even moments where I wanted to make the same choice that those men did. Even after all my training and advocating for others, I couldn’t always be my own hero. But the more I spoke with people and the more open I was, I kept realizing I wasn’t alone. I’ve been with my husband for five years now and he’s seen every low you can imagine. Even with love and support I still had thoughts in my head of negativity and resentment for myself. But I’ve finally come to terms with the fact that those thoughts will come and go, but I can’t. I need to still be here even when those thoughts are gone. In December of 2016 I had ordered a t-shirt for my mother in law with a hokey saying on the front about me being the greatest daughter in law. When you order online there’s a rush of excitement and always that element of surprise. When the shirt arrived, I surely had felt surprise as it had arrived at least 3 sizes smaller than expected. It was too close to Christmas to return it and find another gift so I was panicking! For some odd reason I had the idea of finding a cushion and using the shirt as a pillow case, that way she could still have a use for it. I went to the store and got sewing. I am not a professional sewer, let’s just put that out there. I took sewing class in high school and for my final project I put together a felt dog that you could order from a catalogue. It looked amazing, but the tongue was upside down. I have always kept the image of that dalmation in my mind to remind me that things can be perfect, but if you look closely you’ll see that the small details aren’t always there…especially when I would sew. But I completed that cushion and it now sits on my mother in law’s bed every day. She adores it. 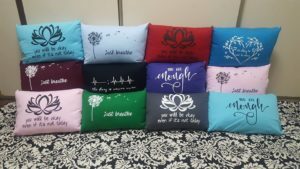 During the summer when we had attended the Strathearn Art Walk to see my sister in law’s booth, my mother in law mentioned to me that I should set up a booth and sell cushions just like the one I had made her. I laughed and thought to myself, well no one else except a mother could love the one I gave her…but imagined that maybe something like that could be fun. I had always loved visiting those markets and seeing their heart and soul poured into things. October 2017. Before Thanksgiving. Two men who I had crossed paths with in my life decided to end their life. Two men died by suicide. This time it was a friends father and another co worker. I felt the same hopelessness and heart ache for those around me. I knew that this had to be a sign, and I had to do more than just take a course. I wanted to support people with more than just the words that I had rehearsed and memorized to comfort them. As I drove home from work in my car with tears streaming down my face, I kept thinking over and over “How can I even make a difference? What can offer someone that isn’t just my words?” I turned onto Jasper ave and screamed…”THE CUSHIONS!” I immediately called my husband Ian and blurted out what I thought was a coherent string of thoughts, but to be honest I don’t really know what I said. What I do know is that as soon as I got home I sent a message to my friend Aleda who runs a silk screen business. After that day, every moment was compiled of ideas filled with promise and excitement, but I had absolutely no clue what I was doing. I spent hours drawing sketches and coming up with mottos and phrases that were the opposite of what you would normally see on a cushion. I wanted to start conversations and I wanted to normalize the stigma around mental health, but I had never hand sewn more than one awful cushion in my life. I had dreams of mass production and markets during the summer, but had never run a business. I wanted to donate to charities in the city, but I had no idea where to begin. But one thing I did have was determination and passion, which ultimately has led me on the path I am walking on right now. I had chosen three phrases and designs to be printed on different colors, and started with 30 cushions. I thought that even if I just sold my initial 30 I would have done something I could be proud of and kept it going if I felt I needed something to do in my spare time. December 2nd I created my first post on Facebook. A week prior I had created my whole page and sparked anticipation with my friends and family saying something was launching soon and to follow me. A few friends saw the logo I had created and thought I was starting a coffee shop, which given the name I completely understood. After spending about 20 minutes in the basement asking my husband again and again to take some photos from a different angle, or to move my hair slightly I had the photo I wanted. I was ready to hit post. I was absolutely terrified and didn’t even want to look at the screen for a good half hour after I had hit that button. But once I had calmed down and logged back on I found I had shares upon shares of my post and messages of support. I knew that the people around me would be on board for almost any random thing but didn’t expect my idea to explode over night. My comfort cushions were something that people wanted. People wanted them to give as gifts and offerings of support. The cushions started a conversation with friends, family and strangers. I created something to give that wasn’t just words. I did it. Keep Your Cup Full is not just my business, it’s my purpose. The heartache and sadness that life has given me has lead me to where I am to be an advocate for myself and has allowed me to open up in ways I never thought possible. I’ve had men and women, old and young share their experiences of depression and struggle, or confide in me about who the cushion is going to. I’ve shed tears with people and just listened to their stories. I’ve started the conversation and cannot wait to continue. 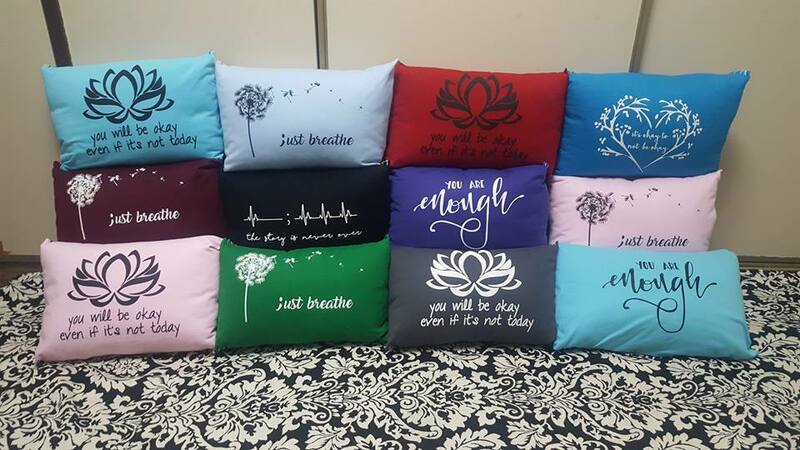 Each comfort cushion purchased has a back pocket filled with resources for Edmonton mental health agencies and counselling center as well as information regarding mental health. Cushions are $25.00 each with $5.00 from every cushion sold being donated to CASA Foundation. You receive a donation card with your cushion where you can put your donation in your name, or in honor/memory of someone else.